Back when Kathmandu had a cosmopolitan caf? culture, Ratna Park was where it was at. It's all gone now, torn down by Kathmandu's demolition man mayor Keshab Sthapit. But in 1968, near Rani Pokhari was a complex that housed the famous Park Restaurant and next to it was the Park Gallery. People hung out at the caf? and strolled over to admire art. Conceived of by artist RN Joshi, Park Gallery was not just Nepal's first gallery of modern art but also a school for budding artists. Joshi took his students out into the outskirts to paint nature in the raw. Years later, Joshi shifted to his native Patan and set up his Park Gallery in Jawalakhel. Joshi died in 1988 at 50. Now, his daughter Nira (pictured) and son Navin have renovated the premises and turned it into a museum of their dad's work as well as a modern gallery to exhibit works by other artists. The complex is being inaugurated on Sunday by Indian ambassador Shiv Shanker Mukherjee and a retrospective of RN Joshi's work will be on display from 11-25 September. RN Joshi was trained at Bombay's JJ School of Art under an Indian government scholarship. He returned to Nepal and at first shunned modern impressionistic styles, arguing that it would be difficult for Nepalis to understand it. Unlike other Nepali artists of the time, he became a travelling landscape artist. He took his brushes, colours, and canvas and toured his magnificent country, sitting down to paint wherever the scenery fascinated him. 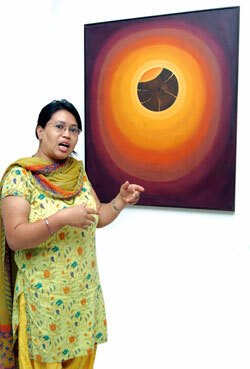 "My dad was a pioneer in travelling landscape art, he was very spontaneous," says Nira, who is curator of Park Gallery. Even though he only showed his landscapes and water colours in public, few people know that in private RN Joshi also painted impressionistic oil on canvas. Joshi also went through a deeply spiritual phase and used tantric motifs a lot. 'Earth Eclipse' and 'Voice of Silence' are from his spiritual phase. Indeed, it was when he returned from Japan that he started working on his exquisite work, 'Universe' depicting the divine Hindu trinity in a serene and cosmic blue-green backdrop. Ninety percent of his works were snapped up by expats in the 1980s and are abroad, but the Joshi clan has collected what it can for this retrospective. RN Joshi's wife and five children are all artists.